The Survival Hax Tactical LED Pen is a handy gadget. It's practical and has a "tacticool" factor. Firs of all, it's a pen and it works well as such. It writes clearly and is comfortable to hold (not too heavy or unbalanced). 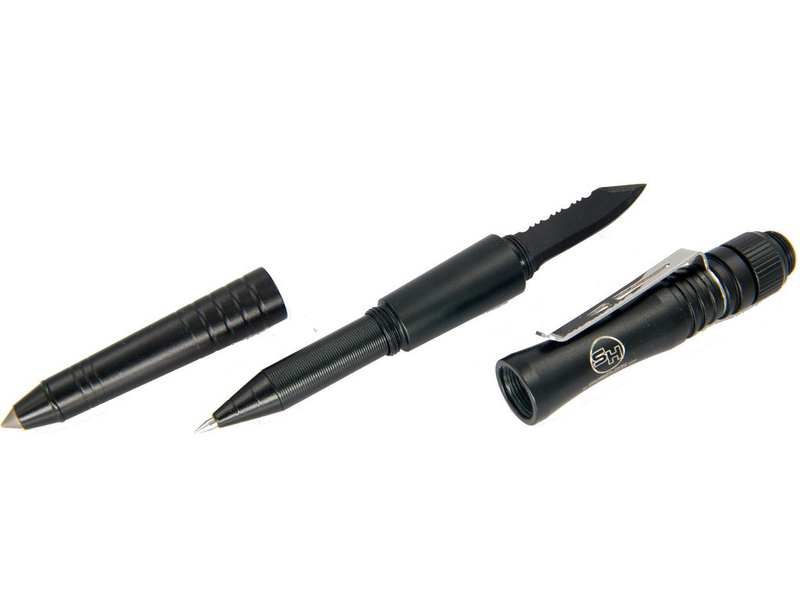 The pen cover houses the tungsten glass breaking tip which is well thought out in my opinion. The back half of the Survival Hax Tactical LED Pen unscrews to reveal a small knife blade with serrations on one side. It's a sturdy knife and nice to have just in case. An LED light is located at the top of the pen. It is a twist on, twist off type light. I would prefer a push button as twist lights often turn on in a pocket and drain the battery. But I can appreciate how that would take more circuitry and space to incorporate into this Tactical LED Pen. The clip on this pen feels very sturdy and should not break off like so commonly happens on ordinary pens. I think the Survival Hax Tactical LED Pen is a great item to keep in a car. One always needs a pen, and it's nice to know you have an LED light, knife, and glass breaking tool as well. The Tactical LED Pen is a great product. My only suggestion would be a different mechanism for activating the light. Other than that, it's perfect. Special thanks to Survival Hax for providing the Tactical LED Pen for review.